← Summer in Mexico: Monuments, Murals, and Mole, oh my! Lately I’ve been returning to the art and literature of the Spanish Avant-garde – the time period that sparked my interest in studying Spanish literary, art, and cultural history more in depth (roughly 1917-1930s). Since I received my copy of an edited volume on the Spanish and Italian Avant-garde, Modernism and the Avant-garde Body in Spain and Italy (Routledge 2016) – to which I contributed an article on the 1929 novel La Venus mecánica (The Mechanical Venus) – I’ve been studying the contributions of my colleagues and re-visiting everything I love about this early 20th century era… the chaos, the rejection of tradition, the innovation, the creation of entirely new art forms (surrealism, cubism, futurism, etc. ), and, of course, the controversy and scandal that accompanied such aesthetics. Salvador Dalí‘s paintings had always fascinated me, and I’ve written several blog posts about his Christmas cards, landscape inspiration, and public service announcements. Certainly Dalí (along with his renowned contemporaries Luis Buñuel and Federico García Lorca) is one of the most representative figures of Spanish Surrealism; however the historical focus on male artists fails to honor the legacy of the women who began to break through social and cultural barriers by forging non-traditional paths of their own (aka, any role that was not almost exclusively “wife” or “mother”) as artists, poets, and journalists. 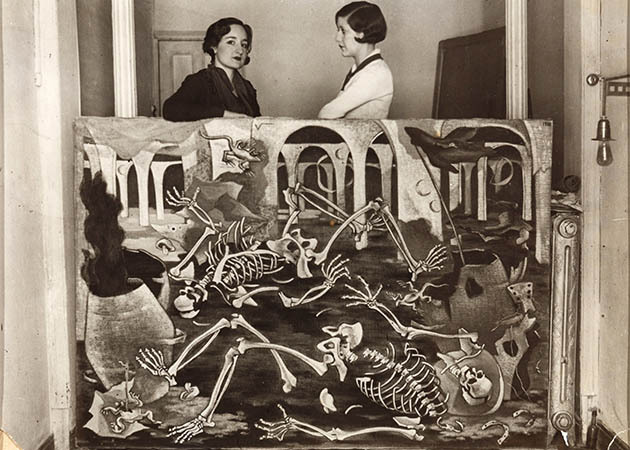 Maruja Mallo (left) next to her painting, “Antro de fósiles” [“Fossil Den”], in 1931, alongside Josefina Carabias (right), who is considered Spain’s first full-time female journalist. Image via Ahora (www.ahorasemanal.es). The above photograph features Maruja Mallo (1902-1995), one of the most talented and controversial painters of the Spanish surrealist scene who participated extensively in Madrid’s artistic and intellectual circles at the height of the Avant-garde. Yet her contributions are only beginning to be recognized in this context. As I continue my research on Spanish women’s literature and cultural contributions during the early decades of the 20th century, I am becoming increasingly aware of my own tendency, on this blog specifically, to write about the most celebrated, recognizable male personalities for my general audience. While I have written twice before about Carmen de Burgos’s novel La rampa, the tragic execution of the “Thirteen Roses,” and women of the Second Republic, in terms of Avant-garde visual art, my posts have predominantly centered on male artists like Dalí and Picasso. As such, it seems I’m perpetuating the lack of attention given to female artists and the privileging of their already canonical male contemporaries. Ooops. Time for some blogging-reflection… When a student – or anyone! – googles “Vanguardia” or “Surrealism(o)”, for example, I’d like for them to find contributions beyond those of Dalí, Lorca, Buñuel, and their male contemporaries. There are already some excellent Spanish articles and blog posts about Mallo — Las amigas de Buñuel, Lorca y Dalí; Maruja Mallo y su ruptura con la pintura tradicional; and Maruja Mallo. Transgresion en la obra y en la vida — however there is little information available in English. 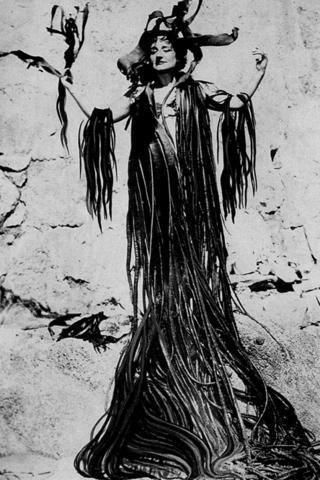 An early sign of her love for masquerade and self-transformation, Maruja Mallo is actually a pseudonym; she was born Ana María Gómez González in 1902 in Viveiro, Galicia, Spain. When her family moved to Madrid in 1922, Mallo studied art and befriended Dalí, who introduced her to Lorca and Buñuel. In fact, in the documentary on her life, “Maruja Mallo. Mitad ángel, mitad marisco,” it is suggested that she embodied the “fourth vertex” of the famous surrealist triangle formed by the artist (Dalí), the poet and playwright (Lorca), and the filmmaker (Buñuel). 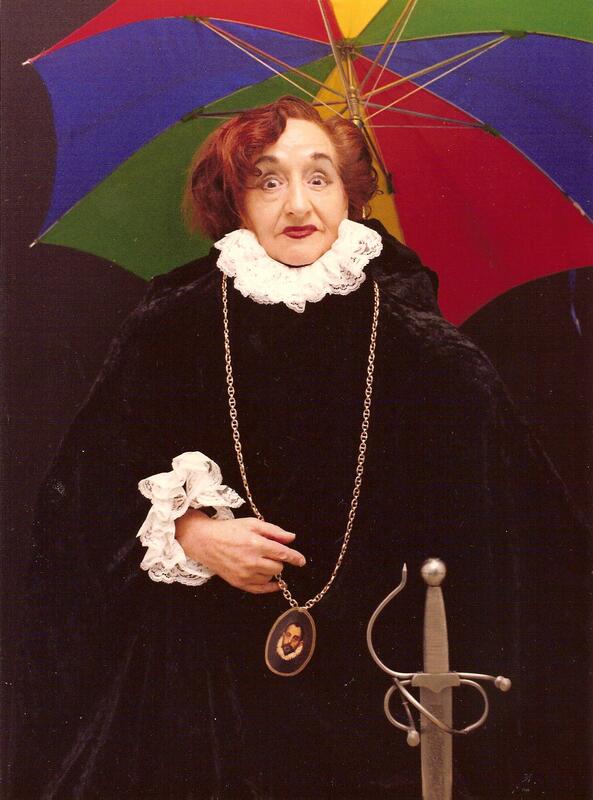 The title of the documentary is taken from Dalí’s poetically surreal description of his friend: “mitad ángel, mitad marisco” – “half angel, half shellfish.” Shirley Mangini, who has written at length about Mallo, describes this vanguardista as the most noteworthy singularity of the Spanish Avant-garde, given that she embodied the clash between traditional Spanish patriarchy and the emerging “modern woman” (“Madrid” 52). In fact, some of her antics and costumes – throughout her life – rivaled those of Dali’s in terms of “surreality,” absurdity, and scandal. While this rendition of an urban street fair features many familiar components, Mangini notes that the central focus of this painting is clearly two strong female figures: “young, muscular women in tennis dresses, obviously representing Mallo and her athletic friend, Concha Méndez, who was a competitive swimmer. Although their masquerade includes wings and halo-like party hats, their extroverted behavior, unladylike stances, and rowdiness defy these angelic artifacts,” yet their tennis attire suggests an upper-class affiliation (“The Gendered Body” 159). Mangini’s chapter focuses on Mallo’s depiction of the female body – specifically, on her tendency to represent women as active subjects that defy the male gaze, rather than as passive subjects or muses merely admired for their beauty and sexuality. Mallo’s unique female representation expresses the freedom and autonomy that she believed women deserved – but that was often denied them – as these qualities would enable them to challenge tradition and defy patriarchal law (159). 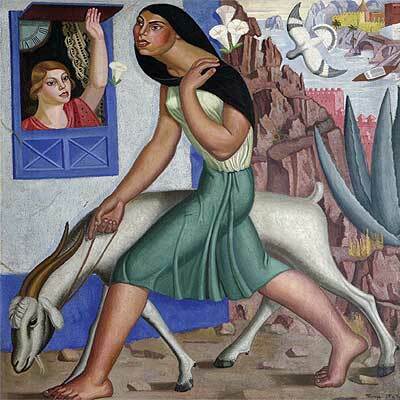 In fact, one of Mallo’s most famous paintings, “Mujer con cabra” [“Woman with goat”], created in 1929, suggests this same tendency towards female liberation in the public sphere. In a second Verbana (below), social class is apparent in the foreground of the painting. The upper-class couple seated on the right is juxtaposed with a working-class couple in costume seated at a table drinking on the left. The bourgeois couple appears stiff, smug, and bored, while their counterparts seem to be more relaxed, enjoying themselves at this particular event (Mangini, “The Gendered Body” 159). 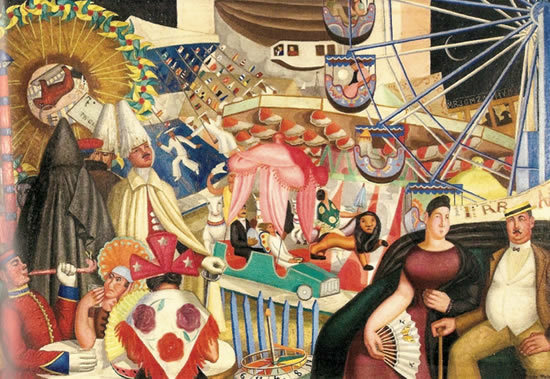 Mangini includes a quote from Maruja Mallo in which the artist explains the subversive natures of the Verbenas, or Carnivals more generally: “That is how the parties and popular fairs were… Irreverence and grace, sarcasm and the creation of a society that ascends and confronts a dominating society, converting it and representing it in a world of ghosts and puppets” (150). For Mangini, Mallo’s juxtaposition of the working and privileged classes suggests that “Spanish politics would soon be changing, that the unruly working class […] would soon dominate the public sphere” (“The Gendered Body” 159-60). 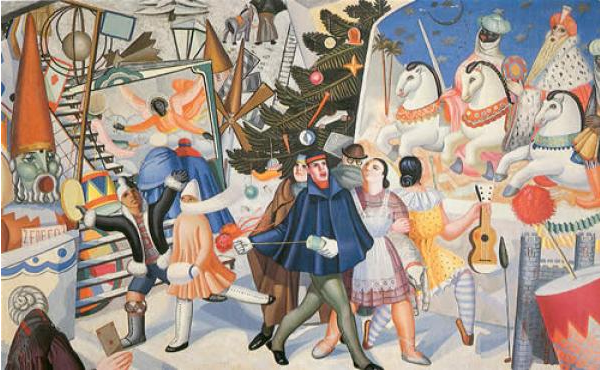 In Mallo’s “Verbena de Pascua” (Christmas Carnival) (below), two rather large women are again front and center, though this time they are not the focal point of the painting. Nevertheless, Mangini notes that their movements and appearance defy social mores, as their “corpulent female bodies prominently fill the space with their ungainly strides and short dresses” (159). Their dresses – a bit short for the time – imply that they are maids or servants, thus further placing their liberated public behavior at odds with the expectations of their subservient duties within a private space. The reversal, rejection, or interruption of traditional hierarchical structures, order, and law are key concepts of Carnaval, as Mikhail Bakhtin has pointed out. 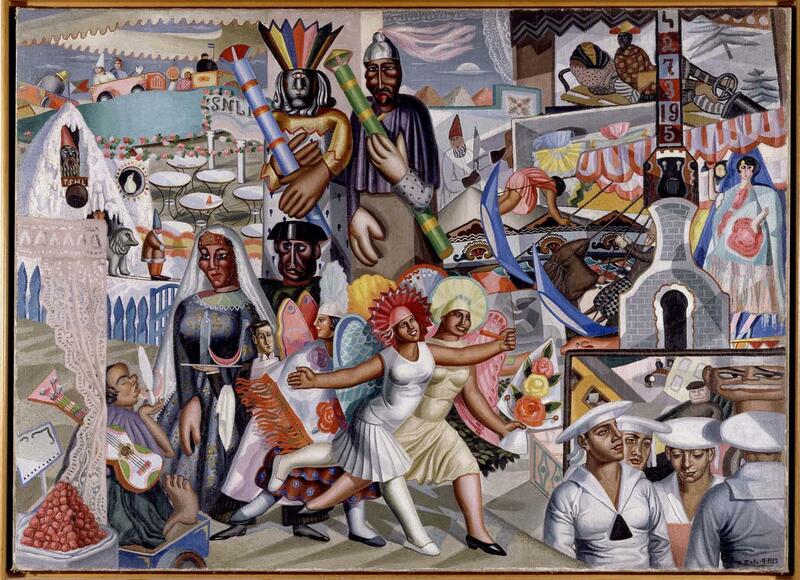 Curiously, Mallo’s Verbenas visually depict these same notions before they were popularized by Bakhtin, and both Mangini and Urioste point out that Mallo’s paintings are perfect pictorial representations of “el mundo al revés,” or “the world turned upside down”. With law and order suspended in Mallo’s worlds, all social classes and age groups share one public space; opposing concepts of the religious and the profane, high and low culture, and the exceptional and the insignificant coexist, and a parodic new image of contemporary society results (Urioste 205). A fourth festival painting, Verbena Kermesse (below), features a celebration specifically associated with the Church. This particular brightly colored, chaotic atmosphere with a religious basis serves as an excellent illustration of Mallo’s fascination with open-air festivities. Mangini quotes and translates her explanation from Lo popular en la plástica española a través de mi obra (1928-36): “They are a pagan revelation and they express discord with the existing order… On these commemorative dates the street crowds meet. The masses take mythology and the saints as a pretext to enjoy themselves collectively. They feel no veneration for the church whatsoever; rather, they parody celestial order and the demonic hierarchies, masquerading with the elements and attributes of the divine and satanic beings” (158). From this commentary, we might assume that the entire social structure – not merely the dominant Church-State institutions or upper classes – become the objects of Mallo’s subtle critique. 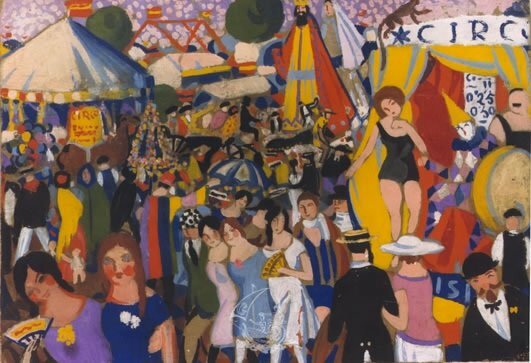 Finally, Fernandez Utrera discusses the possible influence of Salvador Dalí‘s earlier, 1923 rendition of a Spanish Street fair near his rural village of Figueres (Catalonia) – a stark contrast to urban Madrid. 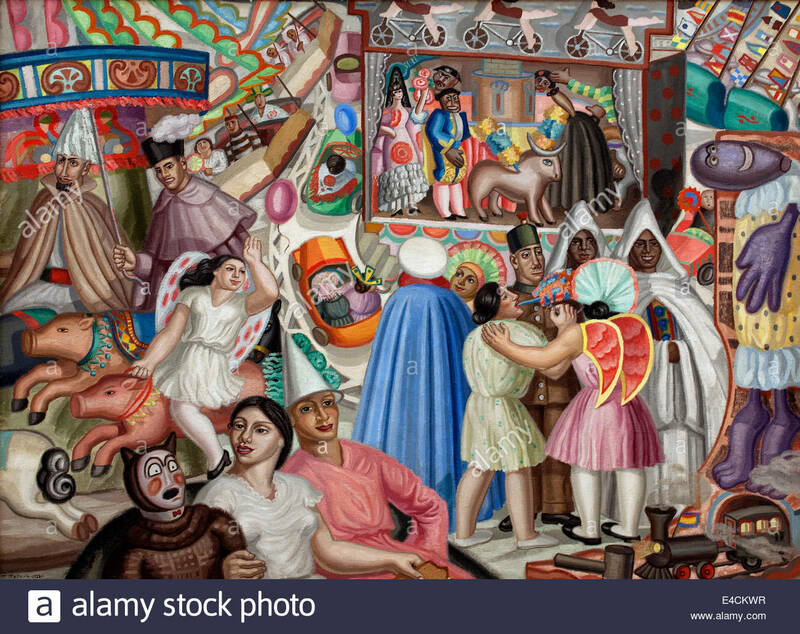 While both Mallo’s and Dalí‘s paintings include typical festival attractions like circus performers, games, giant puppets and masqueraders, Fernandez Utrera argues tht the depiction of the “masses”, or the pueblo, is distinct in these artists’ paintings. In Dalí‘s Ferias de la Santa Cruz de Figueres (Santa Cruz Street Fairs in Figueres) (below), individual attendees become lost among the masses, and this homogeneous pueblo – occupying nearly three fourths of the painting’s space – appears in opposition to the marginal circus performers (96). In Mallo’s Verbanas, however, Fernandez Utrera argues that the crowds, the general populace, actually disappears behind the exaggerated, parodic representations of “Official Spain”, and thus becomes secondary within, if not eliminated from, the world Mallo creates (96). In this sense, Fernandez Utrera challenges the so-called subversive nature of Mallo’s Avant-garde Verbenas by suggesting that her position as an artist-intellectual (minority) prevents her from adequately representing the vast majority of the Spanish populace. What are your favorite paintings or literary texts from the early 20th century Avant-garde movements? Mangini, Shirley. “The Gendered Body Politic of Maruja Mallo.” Modernism and the Avant-Garde Body in Spain and Italy. New York: Routledge, 2016. Mangini, Shirley. “Madrid es un Cabaret y Maruja Mallo la protagonista.” Lectures du genre. Numero 11: Genre et caberet: les loisirs nocturnes du corps (2013): 52-65. PDF: http://www.lecturesdugenre.fr/Lectures_du_genre_numero_11/Contenus_files/5.MANGINI.pdf. (Index, Numero 11: http://www.lecturesdugenre.fr/Lectures_du_genre_numero_11/Contenus.html). Mangini, Shirley. 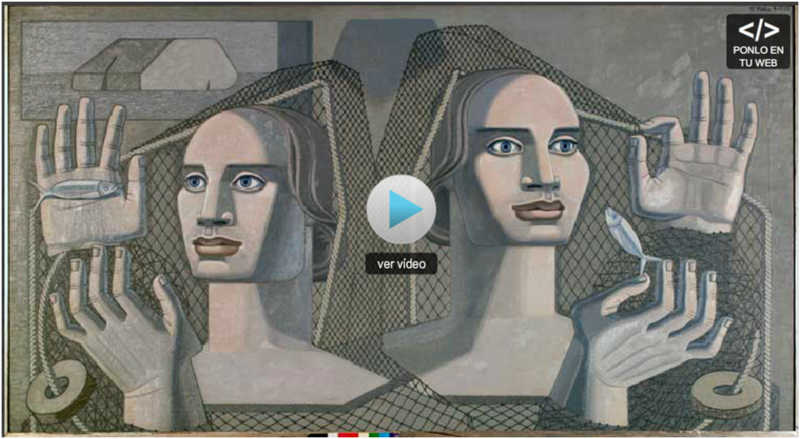 Maruja Mallo and the Spanish Avant-Garde. Farnham, Surrey, England; Burlington, VT: Ashgate, 2010. Urioste, Carmen. “Violencia discursiva y género: El caso de Maruja Mallo.” Homenaje a la Profesora L. Teresa Valdivieso: Ensayos críticos. Newark, DE: Juan de la Cuesta, 2008. p. 197-209. This entry was posted in Art, Spain, Surrealism, Women and tagged 1920s, art history, avant garde, gender, madrid, maruja mallo, modernity, Salvador Dali, spanish art, vanguardia, verbena. Bookmark the permalink. Maruja Mallo era una excelente pintora, muy vinculada, como resaltas, a la llamada Generación del 27 y a la “vanguardia interior”. Hay una monografía ya antigua sobre ella de Consuelo de la Gándara, publicada por el Ministerio de Educación en 1978. En Galicia en 1992 la Galería Pardo Bazán organizó una exposición de toda su obra gráfica y la Junta de Galicia publicó una voluminosa monografía en 1993. Pero es a partir del 2009 cuando han abundado las retrospectivas y publicaciones. En la base de datos del ISBN aparecen hasta 23 publicaciones registradas. Aunque hay que tener en cuenta que el registro ISBN se crea en 1972, por lo que para investigar lo que de ella se haya escrito o expuesto antes de esa fecha hay que recurrir a otras fuentes.